The 1976 Lotus Esprit Series 1 was an instant on-screen classic in the chase sequence in Sardinia – and that was before it converted in to a submarine. Some will choose the 1964 Aston Martin DB5 driven by 007 in Goldfinger and Thunderball, but the Lotus Esprit from the Spy Who Loves Me gets our vote. Outatime .. the gullwing doors open and Doc Brown introduces the time machine to Marty McFly … it doesn’t get better than the futuristic stainless steel 1981 DeLorean DMC-12 designed by the legendary Giorgetto Giugiaro. Steve McQueen as Lieutenant Frank Bullitt in arguably the greatest car chase ever … the highland green 1968 Ford Mustang GT 390 in a genre-defining car chase on the slopes of the San Francisco streets … much copied but never equalled. 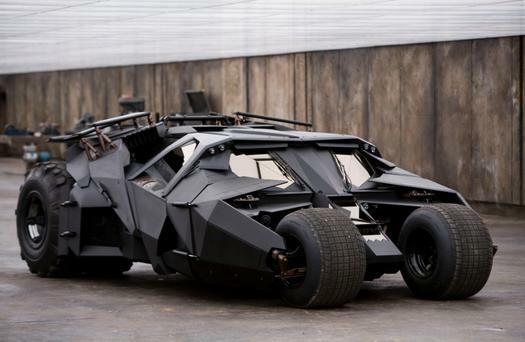 Batman It doesn’t get better than a Batmobile, more specifically the Batmobile Tumbler from Batman Begins. It’s all about the extras here from twin forward-firing machine guns, a rocket launcher to a vector-controlled jet engine at the back and of course the stealth mode to shake off pursuers. The incredible power of the 1970 Dodge Charger in the Fast and the Furious, driven by Dominic Toretto, is due to reappear in Furious 7 driven by Dom as a hero car. The beautiful black Dodge Charger first made an appearance way back in the original film in the franchise and there is huge anticipation around its reappearance. And there are more contenders: Lightning McQueen from Cars … Herbie the 1963 VW Beetle from The Love Bug; the Cadillac Ambulance from Ghostbusters; the GT Ford Falcon from Mad Max and the Dodge Challenger from Vanishing Point. Also now a part of Hollywood history as the best cars ever seen on screen are the American Graffiti ’32 Ford Coupe; the ’77 Pontiac Trans Am from Smokey and the Bandit; Mini Cooper S from the Italian job and of course the metallic blue open-top Sunbeam Alpine driven by Grace Kelly in To Catch a Thief. What’s your most iconic on-screen car ever?